It's time for our week #3 Me Made May 2016 round-up! Since I missed out on wearing any homemade outfits last week due to feeling poorly with a bug, I wanted to make the most of it this week. So here we are! Thursday - attending an all-day conference in London in my new Bottle Green Liberty dress. 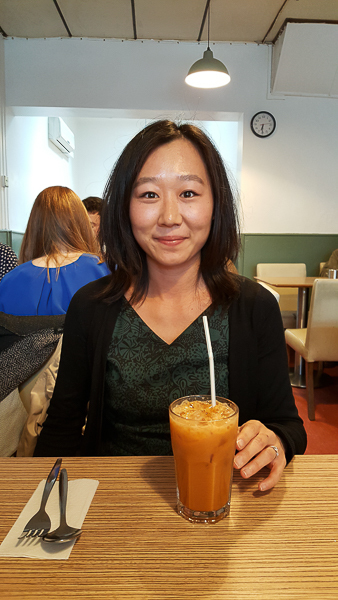 I met a dear friend of mine afterwards in an amazing little Thai Cafe near Waterloo. Just about to sip my Thai ice tea here -- one of my favourite drinks of all times! The weekend is going to be filled with decorating and other home improvements, so chances are, my home made wardrobe will be getting a little well-deserved break :) Whatever you will be up to this weekend (hopefully something a little more glamorous than what I've got planned), I hope you have a great one! Hey guys! I hope you are all having a good week so far! Anyhow, I'm back with a new project to share with you. It's completely back to basics, but at the same time really rewarding as it was so quick to knock together. 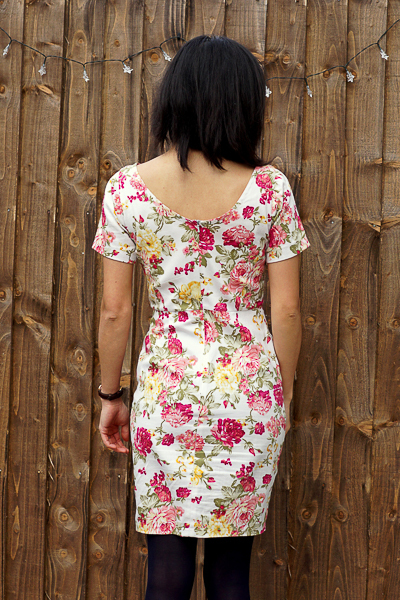 The pattern is Simplicity 1106 - I made view D but without the cut-out in the back. 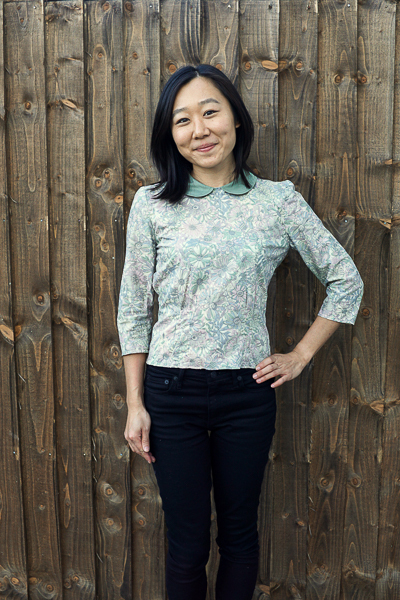 I had been wanting to find a simple, dartless and loose-fitting blouse pattern for quite some time, and I'm really pleased to say that this is exactly what I have been looking for! 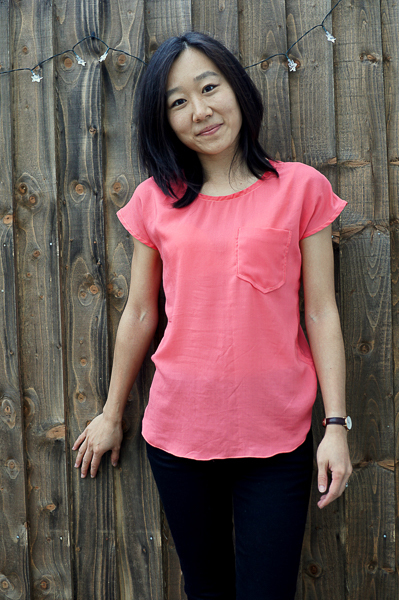 I love the neckline, the little sleeves, the shaped hem, and the optional pocket. It's basic, and extremely versatile. I need to give that pocket a better press! 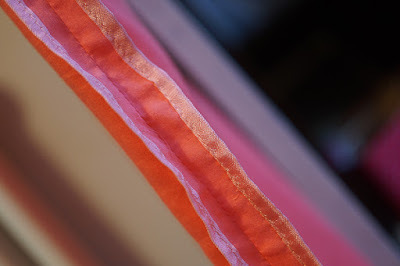 The fabric is a lovely, soft coral viscose/rayon that I have had in my stash for years. It's really comfortable to wear, but does wrinkle up rather easily. I finished the seams with a rayon seam binding in a light coral, which I picked up from my NYC Garment District trip a couple of years ago. 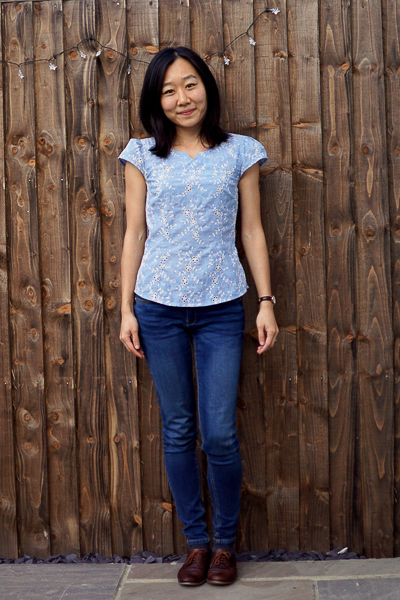 As this top cried out for a narrow hem, I got out my narrow hem foot, and gave that another go. Viscose isn't the most well-behaving fabric for this sort of thing, but I managed an okay hem by turning the speed limit down on my machine to the lowest setting. Did anyone see Jamie churning out narrow hems on his skirt on the Sewing Bee on Monday night?? One round down, I'm putting my money on him to win -- what a legend! For a quick project, I'm pretty happy with how this top has turned out. I can see myself throwing it on for both dress up and down days, and the colour is perfect for spring. 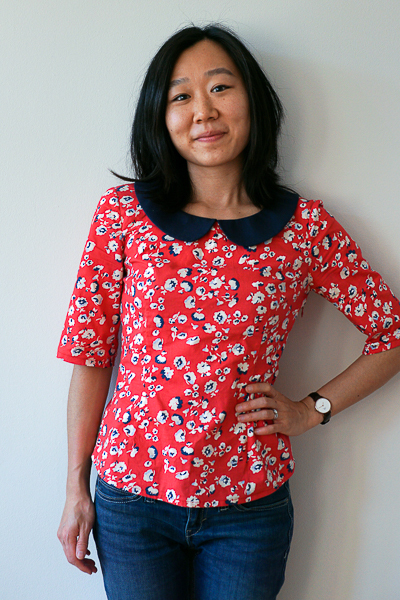 More importantly, I feel like my sewing prayer for a nice, basic woven top has finally been answered. Thank you Simplicity! 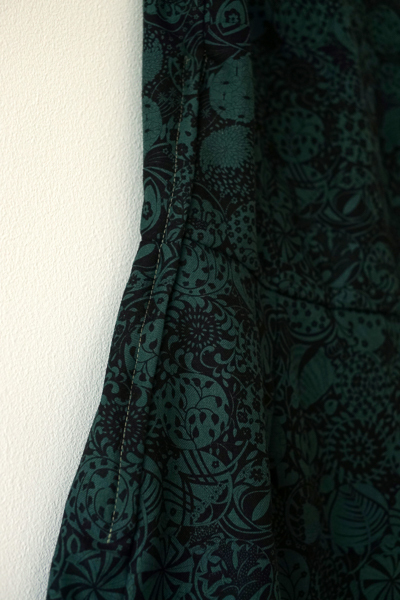 I am already planning my next version in a beautiful piece of printed silk. Enjoy the rest of your week. I'm now off to check out all your week 2 MMM outfits! It's time for the first round-up of MMM '16! It's been a beautiful week here in the UK, finishing on a heat wave over the weekend reaching 26 degrees today! Unfortunately, I have been feeling rather poorly from Thursday night, with a super sore throat, a high fever, and an annoying cough, so couldn't quite enjoy the best weather to the full. My MMM wardrobe suffered slightly as a result -- I so wish I had me-made PJs for those unwell days! That's it for week 1! All things considering, I haven't done all that badly. Let's hope the sun keeps on shining for week 2! Remember my test run for the Vintage Vogue 1137? More than 2 entire years later (! ), I'm pleased to say that the "real deal" is done, and just as I envisaged when I picked up this beautiful piece of Liberty wool in an unusual bottle green colour from Goldhawk Road. Long term readers of this blog will know that green is not a colour that I reach for very often; I can't help but think that the drawings on the envelope may have something to do with my fabric decision here. Thinking about it, I can't actually understand or explain why it took me so long to pick up this pattern again. 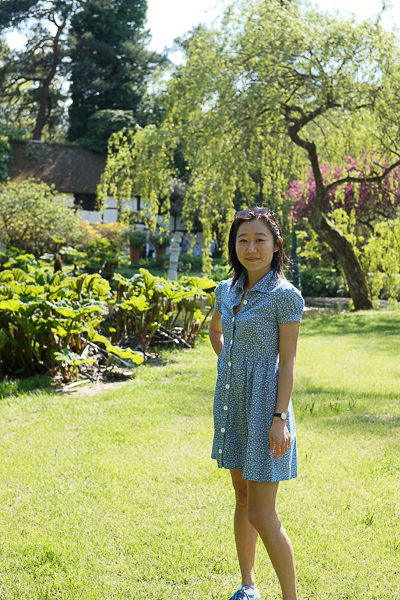 My test run had gone really well, and the unlined cotton dress ended up getting plenty of wear, for its comfy-to-wear, easy-to-pack, simple-to-style qualities. What's not to like? In fact, it featured so much in my work wardrobe that the colour has even faded slightly in the wash! 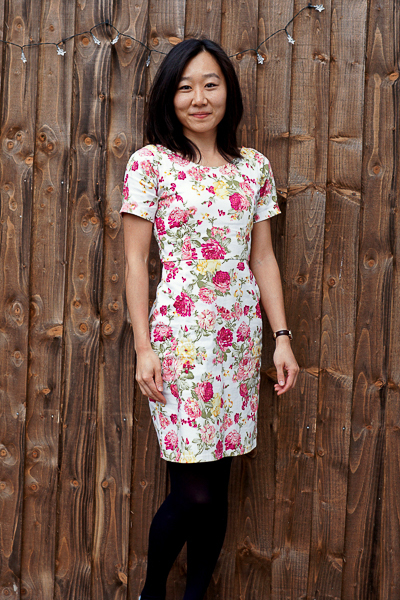 No wonder Vogue 1137 was one of my pattern picks! When I did eventually pick up this lovely pattern again, I felt very grateful to my younger self that I did not need to make any alteration to it. The only thing I did change for this version was adding a lining, and I sure didn't hold back! 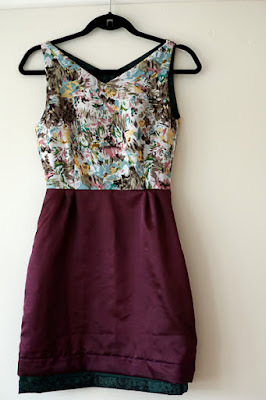 Oh how I so wish this dress was fully reversible! 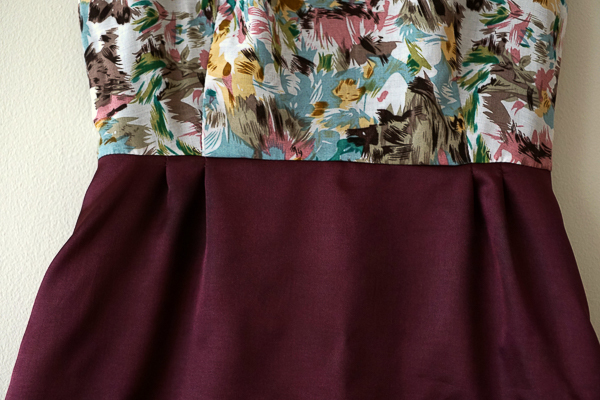 The bodice lining is a super soft watercolour viscose (I only had a tiny piece), and the skirt lining was the leftover aubergine polyester lining from my Ultimate Work Skirt. Now I want to make version #3, in something slinky and dressy! A couple of notes on the construction. 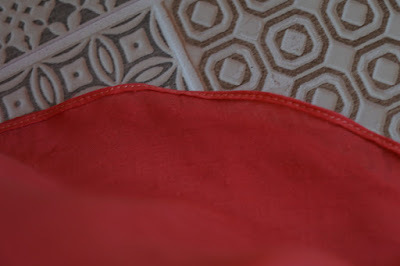 First, as explained in my skirt lining tutorial here, instead of sewing full darts, I opted for tucks on the skirt lining to allow some additional ease (see picture above). It worked well, and I can move very freely in it. The second one is about inserting the bodice lining. I didn't follow the instruction for this, but instead, I used this super clear tutorial (based on the same pattern!) which let me get away with minimal hand sewing. It worked a treat! The only hand sewing that I ended up doing was stitching the lining to the lapped zipper, and finishing the dress with an invisible hem. 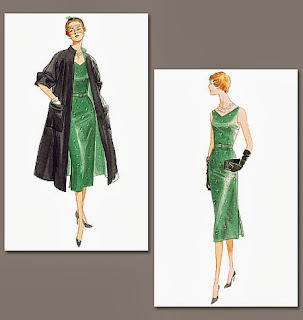 Remember these subtle but elegant V-necklines? Front and back? 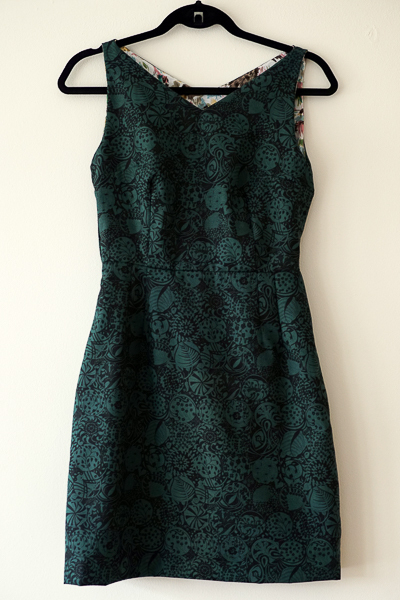 I'm so pleased with how this dress has turned out (and in! ), and am proud to have this addition to my work wardrobe. It was worth the wait, after all! Me-Made-May '16 -- my last minute pledge! Hey guys! I thought I left it late last year, but somehow I managed to be even more "spontaneous" this year! It wasn't about the dithering so much this year; instead, I simply hadn't had the time to make my pledge until now. The first 4 months of 2016 have seen me pretty busy spending almost all my spare time on works on our house -- we've had our garden landscaped, upgraded our central heating and boiler system, completely refitted our cloakroom, ripped out our en-suite, and had our front door replaced, with a new back door on its way, too. 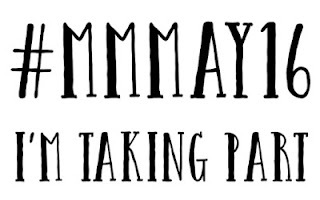 I've actually enjoyed it all, especially picking up some new skills, but it has meant that my sewing (and this blog) has suffered somewhat. That said, I have got a few projects lined up to share with you very shortly, as soon as I get a chance to photograph them. I shall look forward to seeing all the MMM outfits from everyone!